Updated 2/22/2018 The first of these interesting vases was discovered, and purchased, by Glen and Steve Thistlewood in 2014. They thought they had a lovely example of an Athen vase, made by August Walther in Germany. Diligent research determined that their vase wasn't an Athen at all but was in fact made by the Polish company Hortensja. Confirmation was confirmed with Hortensja catalog illustrations. Glen and Steve named the pattern Athina to differentiate it from the Walther pattern, but to acknowledge the similarities. Their vase is 4.25 inches tall with three rings of vertical blocks. The 6.5-inch example on the left was purchased by Bob and Sandy Sage in 2015 at the Great Lakes CGC Tom Burns convention auction. There are, at this time, three Athina vases known (one in each of the three known sizes) all in marigold. The 8-inch version, with four rings of vertical blocks, is in Europe. To read more about these fascinating patterns and see the catalog illustrations on Glen and Stephen Thistlewood's site click here. The Athina vase could be confused with the Nola vase by Inwald. 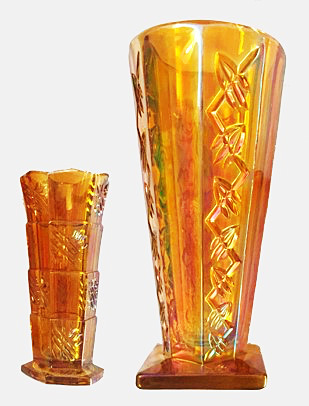 Similar elements in the two vases are reminiscent of the Art Deco style of the 1920s and 30s. Note the symmetrical arrangement of geometric shapes in both vases as well as the stylized intaglio pattern designs. All photos are courtesy of Sandy Sage.